★ The High Beam will be on, when you firstly turn the switch off and then on. The Low Beam will be on, when you secondly turn the switch off and then on. The Strobe Flashing will be on, when you thirdly turn the switch off. ★ Light Color: Emit Super Bright White Color Light. ★ Light Power: High Power CREE 125W. ★ Environment Temperature: -40---40 degree centigrade. ★ Working Voltage: DC 12V-80V Wide Voltage Universal. ★ Material: Aluminum alloy outer frame / U5 lamp beads. ★ Headlight life no maintenance, environmental protection. ★ Design radiator, radiator more ideal. ★ Night driving be obviously strong pillar. ★ Suitable for pavement, super province electricity, night driving more fuel efficient. ★ More secure, absolutely not the deficit battery. ★ Installation: with a bracket, then connect the positive and negative poles correctly. ★ The 3 lighting modes are controlled by the switch of motorcyle headlight. ★ Light modes: high beam, low beam lights, flash (by continuously pressing the power switch). ★ Wire length: approx.50 cm. ★ Size: For a 7/8" diamater handle bar, but can be adjusted a little smaller or bigger to fit your handle bar. ✔ High Power CREE U5 125W LED Light and Super Bright, bring you more safety when driving. ✔ Recommended Reason:Low power consumption, no maintenance, environmental protection.High performance price ratio,strong light intensity and Ultra low current output,Can provide enough brightness and save a lot of energy for your motorcycle bikes. made of high quality aluminium. 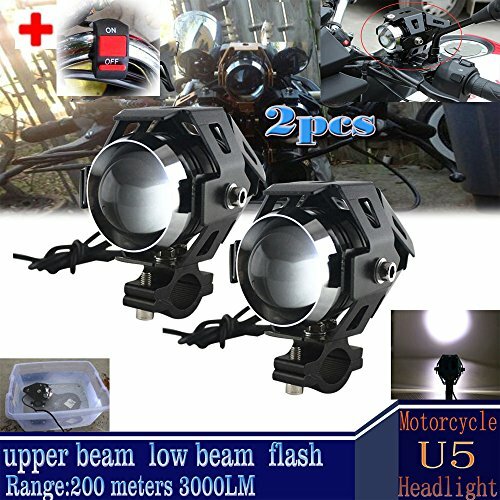 Universal headlightspotlight for motorcycle, atv, suv, bus, boat, cars, trucks. Design radiator, radiator more ideal, unique blasting flash function. ✔ HIGH-QUALITY,LONG LIFE TIME,LOW POWER CONSUMPTION - Made of high quality LED chips.Made of Die-cast Aluminum Housing .PMMA lens. Working Input Voltage: DC 12V-80V Wide Voltage Universal. Service life over 50,000 hours. IP68 waterproof. headlight life no maintenance, environmental protection aluminum alloy casing. ✔ BUILD IN THREE MODES OPERATIONS - HIGH BEAM,LOW BEAM AND STROBE FLASHING-The High Beam will be on,when you firstly turn the switch off and then on.The Low Beam will be on,when you secondly turn the switch off and then on.The Strobe Flashing will be on ,when you thirdly turn the switch off and then on. extremely bright, even in the daytime,at night or in bad weather.The flux is 3000LM and the projected distance is about 100 meters to 200 meters. ✔ Well-designed, If you are not satisfied with it. Please feel free to contact us, we will offer you a FULL REFUND or new REPLACEMENT. motorcycles led light please search B074C6DS5K. If you have any questions about this product by GOODKSSOP, contact us by completing and submitting the form below. If you are looking for a specif part number, please include it with your message.